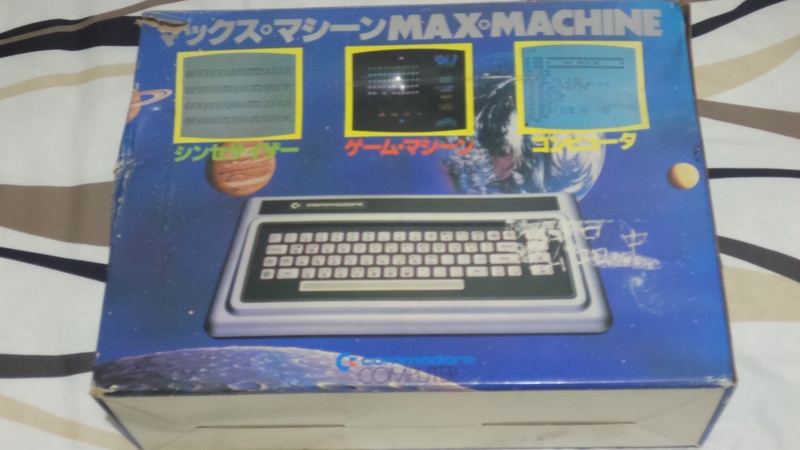 My first foray back into Commodore collecting was this semi-rare machine by Commodore Japan. Pretty sure it was my first Yahoo Auctions purchase (Japan is the sole country where eBay lost the online-auction war so Yahoo Auctions still prevails here). The price fluctuates wildly; I’ve seen untested units without box or power supply go for as little as ￥15,000, and I’ve seen unused units or good condition units with multiple boxed games go for as high as about ￥70,000 ($150-700 or so). Games average about ￥5000 in their boxes. I see about three or four of these machines a month, although sometimes there is a dry spell where only one or two overpriced units are available and don’t sell. 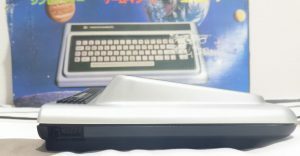 Mine was midrange in price, at about ￥32,000, including two cartridges: Music Composer (boxed, okay condition) and Avenger (loose). It includes a box, but the box is not in good condition at all, so I kind of want to get rid of it. With such limited space, I only want to keep boxes if they’re in really good shape. But I can’t bring myself to throw it out. 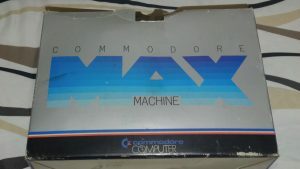 MAX Machine is a tremendously stripped down version of a Commodore 64, although the two machines are definitely related. Some key similarities: they both have a SID chip, both have a VIC-II chip (although they’re not compatible VIC-II chips), and a handful of their cartridges are compatible with one another. 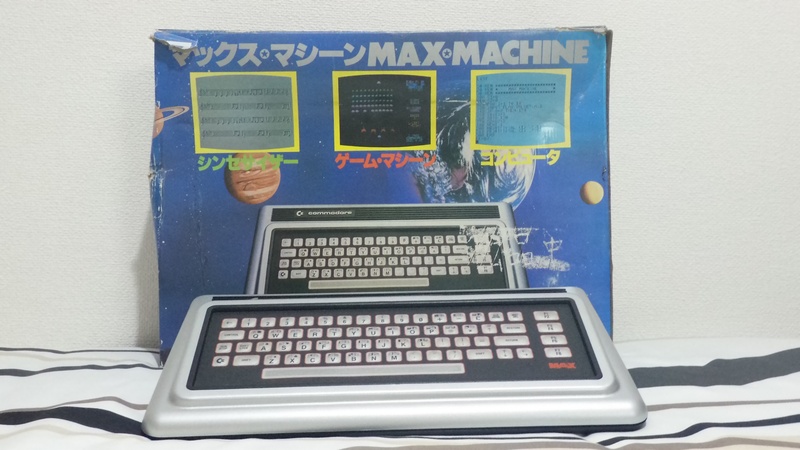 If you remember the Commodore-branded C64 cartridges like Radar Rat Race, Jupiter Lander, and Kickman, usually very simple games, they were often originally released on the Commodore MAX Machine, developed by Japanese software developer HAL Laboratory. For starters, there was a clear color palette difference. The first run of Commodore 64s had a grayish case (later tan) with brown keyboard and white lettering, the MAX has a kind of futuristic-looking black and silver design with red accents. 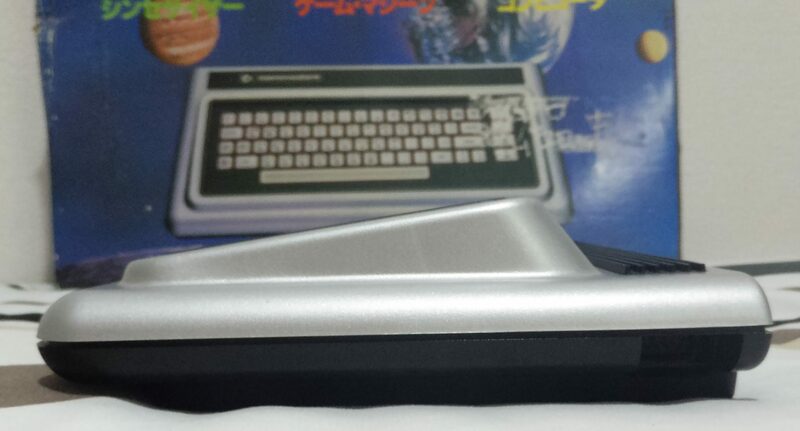 And the keyboard itself is a membrane type, compared to the C64’s full-travel keyboard. Around the perimeter also holds some differences. One thing I consider a big plus is that the MAX Machine had one joystick port on each side. ON. EACH. SIDE. Behold! Oops! You can’t see anything because they’re pretty deeply recessed. But trust me, there’s a port on each side and it’s great because then the joystick cords don’t get tangled and you don’t have to worry about sitting so close to the computer if you’re sitting on the opposite side of the joystick ports, as you do with the Commodore 64. As if I have anyone to play with, and if I did, as if we’d choose to play Radar Rat Race, right? The back has some familiar (inter)faces. If the power connector looks a little too much like the C64 power connector for comfort, that’s because they’re the same. No MAX Machine power supply but got a C64 one? You’re in such luck; you can MAX Machine. Power switch is up/down, also like the C64. The audio port is unique; despite only having an RF port for video as opposed to a dedicated video port as the C64 had, they nonetheless decided to provide an audio port. For reasons explained later, this is actually tremendously (albeit accidentally) useful. Cartridge port. Although only a handful of games are compatible, the port itself is the same as the C64’s. Standard RF channel selector and jack. Only difference is that instead of channel 2 or 3 in the US, it’s channel 1 or 2 in Japan (sorry, NHK). And the cassette port is also the same as a C64’s. So if you have a C64 setup, a MAX Machine can take advantage of a few things you may have lying around. But the MAX Machine provided a bit of a challenge when trying to function in today’s more sophisticated world. 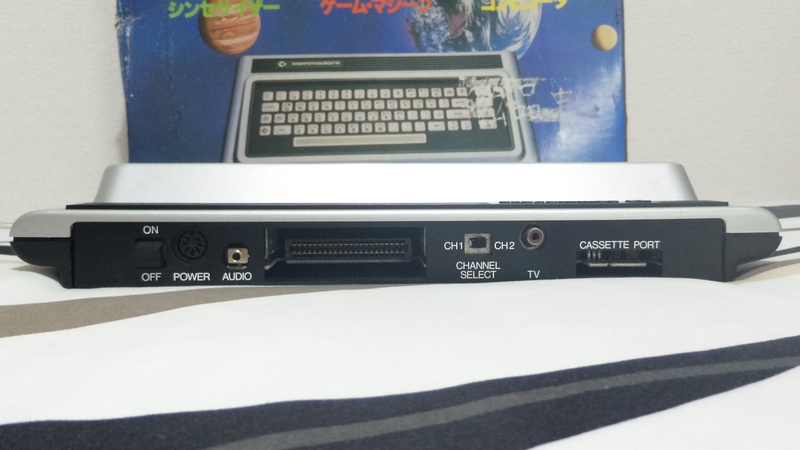 Can’t just take it and plug it into a modern television (mine has only a digital tuner, while the signal is analog) and since there’s no video port, you can’t even connect it to an RCA jack. At first, I could only confirm that the machine worked by plugging in headphones to the audio port, plugging Avenger into the machine, and guessing that F1 would start the game. I heard noises (putt. putt. putt. putt. POOOSH! ), so I felt somewhat relieved that it was at least partially functional. Don’t be disappointed, this is not the aforementioned “tremendously useful” feature of the audio port. Although, don’t get me wrong, producing audio is awfully useful! No, definitely, the first thing you should do with a MAX Machine is perform this so-called “single-wire” mod. You route the video signal from the VIC-II to the unused pin of the monophonic MAX Machine’s stereo jack, and voila, single-channel audio and video are now available on the audio port. Grab a stereo Y-cable and connect to an RCA AV jack and you’re up and running! This is the tremendously useful feature of the audio port, so please be excited now. However, I don’t know how to solder (yet? ), so I have to wait a bit. For now, this remains a visual curiosity in my collection. I’m Sean. I grew up in the 80s, with a deep fascination with computers. My first experience with computers was at my aunt and uncle’s home. They’d recently acquired the first computer of anyone in my extended family – a Commodore 64. Until I saw that computer, the closest experience I’d had was playing my Atari 2600. A keyboard was a fascinating way to interact with an entirely new world of electronics. I was hooked. My family couldn’t really spare the cash to just buy a computer, so my mother encouraged me to save money from my modest income, which I earned by helping her fold gowns from my uncle’s physical therapy practice. After about a year, I’d saved enough to buy a Commodore 64 of my own. But I didn’t have to. At almost the exact same time, my father’s boss decided to upgrade from his Commodore 64 to a PC. So he gifted me his system – a Commodore 64, a 1702 monitor, a 1541 disk drive, a joystick, and The Bard’s Tale. There were probably a few other things included, but that was my main memory of it. I also remember going to Target the next day and buying a two-pack of games – Frogger (if you have to ask…) and Threshold (a space shoot-em up game). I grew up in California, where I had something that I wouldn’t really appreciate until later in life – space. Ample space. More on that later, but it afforded me the luxury of my own room and a place to hide out and play with my computer setup. This was a major factor in shaping me during my formative years. Namely, I became a hermit and an introvert! With so much time to fill, RPGs were a natural match for me, and I quickly became a completionist. I spent many hours until the sun came up, looking for every last item, every tiny detail, and every exploit that RPGs of the time allowed (or didn’t prepare) for. I moved into my own apartment in my early 20s. It was an unbelievable location – a huge loft directly over the office I worked at, and I was permitted to live there rent-free, in exchange for being on call 24/7. My boss was a nice guy, though, so rarely called on me at indecent hours, such as 9 in the morning. In that apartment, I entered my most aggressive phase of computer collection, with about thirty vintage computers, all set up and working, either with a dedicated monitor or a couple of computers near each other that would share a monitor. Fast forward another ten years, and I found myself a pretty changed person. I’d given up the computer collection in favor of arcade games (had about twenty-five – space is so good!). I was more social; I had started enjoyed going to dance clubs, having house parties, etc. But perhaps most surprisingly, I’d made the decision to move to Japan. So that’s where I am now. I love it out here. It’s quite safe, it’s comfortable, it’s convenient, and the food is delicious. I have a beautiful and understanding wife. I have a healthy and sometimes rambunctious but (usually!) kind son. But there’s one thing I didn’t have: a vintage computer. So after being out here for seven and a half years, I changed that. I joined Yahoo Auctions (no eBay out here). You can take a horse to water, but you can’t make an overnight MSX fan out of a Commodore fan. A Commodore guy in Japan, I joined a very niche market with high price tags and limited availability. But Commodore had a Japan division, so things are also kind of interesting. 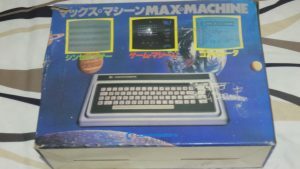 I started my new 8-bit journey with a Commodore MAX Machine – a completely unique looking machine from the Commodore Japan 8-bit line. 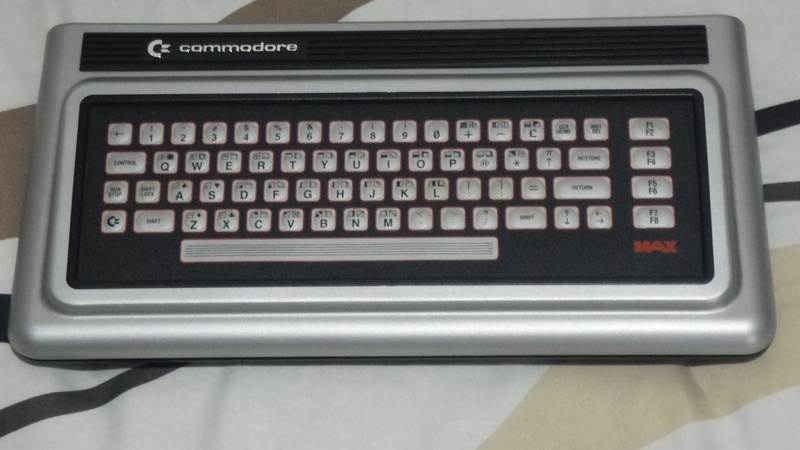 It was released at the same time as the Commodore 64 was released in Japan, but it was a far more limited machine. You can find details about that in the MAX Machine posts. So I lied, there’s a second thing I don’t have out here… a lot of space. So that’s kind of what this blog is about. Being a Commodore fan in Japan, details about my acquisitions, and the torture I put myself through just to fit it all in my room.